And Lo, 'tis time for this week's Waiting for Wednesday. Despite the fact that I am not feeling 100% this week, the show, as they say, goes on. Actually, I've felt pretty lousy since early last week, but deadlines at work meant that I had no choice in the matter. And, no, it's NOT that pig thing what's being talked about on the TV. I mean, yes, I was kinda paranoid about that for a day or two. And it's been fun being told by everyone I know that, most likely, I have Swine Flu and should stop moving immediately. But, according to a doctor (a medical professional, and not the guy that lives down the block and calls himself "Dr. Strange") I do not have the Swine Thingy, but I should take things easy. And my first question back to the doctor was, "'easy,' as in I shouldn't go out Wednesday?" His answer was, "Wednesday? I'm not sure I underst--" "Wednesday, Doc. Give it to me straight up--can I or can I not go out on Wednesday?" "Um," he started, a bit confused and a bit frightened, "I'd say it's safe to go out on Wednesday, Alex. Just don't do anyth--"
But by that point I was gone. There was an Alex-shaped hole in the waiting room wall, and I was content. Utterly, stupidly content. And, yes, that "Iron Man" on the cover is Norman Osborn (you know, the Green Goblin). Yep, after the events of Secret Invasion, ol' Normie is the new Director of S.H.I.E.L.D. and he has turned his (evil) Thunderbolts team into "The Avengers." So, everyone out in the Marvel U thinks those guys and gals flying around and punching stuff are the true-blue Avengers team...but, um...they're not. Because they're evil. And stuff. Now, this book has been a great read so far, and I fully expect big and scary things to continue as the series progresses. I've said it many times before, but Bendis is my favorite writer (and that's pretty much why I haven't had many--if any--of his books on the list for any previous Waiting for), but I'm digging this book so much that I had to put it up for today. 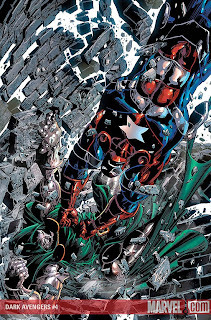 The Dark Avengers’ first mission shows Norman Osborn all the pluses and minuses of the choices he has made for his team. So changes must be made. Some come, some go, and not everyone is happy about it. Also, the Cabal reunites for the first time since the Dark Reign began, and they are REALLY not happy. Okay, moving on, next up, we have issue four of the latest effort from Bone creator Jeff Smith. This series, entitled RASL, is one of the more intriguing books to hit the market in some time. Cartoon Books proudly presents Jeff Smith's new adventure series, RASL - a stark, sci-fi series about a dimension-jumping art thief, a man unplugged from the world who races through space and time searching for his next big score - and trying to escape his past. In this first of three graphic novels, Rasl faces an assassin's bullet and stumbles across a mystery that not only threatens to expose his own illicit activities, but could also uncover one of the world's most dangerous and sought after secrets! 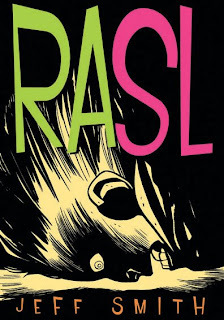 RASL's world is closing in around him and the only way to regain control is to leave it! The multi-dimensional art thief returns to the parallel universe where Dylan isn't Dylan, where he makes startling discoveries about his past -and about the nature of reality itself! Rasl and the lizard-faced killer battle it out as the the origins of the science behind Rasl's inter-dimensional engines are revealed. Rasl himself is faced with a choice: surrender his secrets or spend eternity chasing the lizard-faced assassin through parallel worlds trying to save the people he loves. I was a big fan of Smith's Bone series, a whimsical, Lord of the Rings-type epic that was all-ages friendly (and you should go read it!). While RASL is decidedly more mature than Bone, there's still a sense a wonder in the art and the epic nature of the story. Smith's art is similar in some ways to Terry Moore's, as both artists are masters of white space and clean lines. If you liked my recommendation for Moore's Echo series, then I think you'll like this book, as well. And, finally, we have an interesting book from Dynamite Entertainment, written by Leah Moore and John Reppion, with art by Aaron Campbell (or Douglass, as both names are listed on the site! ), and covers by John Cassaday. Sherlock Holmes, issue one hits stand today, and other than some promotional material I've read in the comics press, I don't know a whole lot about the book. But, Dynamite has put out some really stellar product (The Boys, Red Sonja) and I've become a fan of their work. They've also had some nice runs with licensed properties (Zorro, The Man With No Name), so I have faith that this book will be of the highest quality. 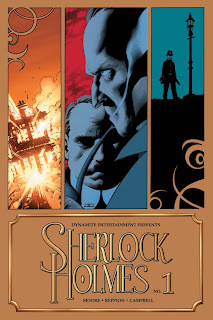 Continuing their new exploration of literary icons, DYNAMITE ENTERTAINMENT presents the ultimate mystery as they unveil Sherlock Holmes! Issue #1 begins the "Trial of Sherlock Holmes" which presents the great detective with an all-too personal quandary and explores the nature of the man and his world with a mix of refined ambiance, carefully crafted mystery and chilling suspense! So, go check it out if you're a Holmes fan! And that's all there is for today. Enjoy New Comics Day, everyone!